Hank Bassen’s stellar goaltending lifted the Detroit Red Wings to a 2-1 win over the New York Rangers last night. Bassen was only in the Wings net thanks to a hunch played by Wings coach Sid Abel. The win moved Detroit to within one point of third-place Toronto. 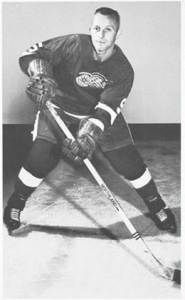 Gordie Howe scored at 7:29 of the third period to provide Detroit with their margin of victory. It was the big man’s 29th of the season. Bob Wall scored his first NHL goal. New York held a 1-0 lead after the first period on a goal by defenseman Jim Nielson, his fourth. Rookie blueliner Bob Wall tied things up for the Wings just past the midway mark of the second period. Rangers goalie Cesare Maniago was the other star of the game in a losing cause. Detroit outshot the Rangers 40-26 and if not for the lanky netminder, the score would have been much more lopsided in Detroit’s favour. Bassen, normally the backup, started the game for the Red Wings and was very strong as well. Bassen got the call thanks to a whim played by Red Wings coach Sid Abel. Abel said that earlier in the week he expected to start rookie George Gardner in goal. Gardner had played well against Toronto on Sunday night. In addition to his goal, Howe also set up the other Detroit goal. It was Wall’s first NHL marker. 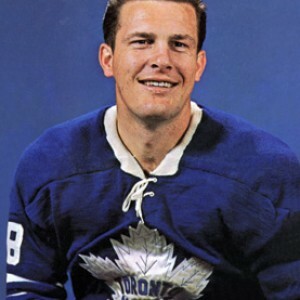 Toronto Maple Leaf defenseman Kent Douglas has been suspended for two games by National Hockey League president Clarence Campbell. Douglas received the sentence for his part in a fracas that took place Saturday night in the Leafs’ game against the Chicago Black Hawks. Douglas became engaged in a fight with Chicago’s Doug Mohns. Mohns managed to break away from linesman Neil Armstrong and began pummeling Douglas. Douglas was in the vice-like grip of linesman John D’Amico and was unable to defend himself against Mohns. When Douglas finally did break free, and he did that only by shedding his sweater, Mohns had left the scene. Douglas turned his anger towards D”Amico and is alleged to have taken several swings at the official. He was assessed a minor, major and game misconduct and thrown out of the game. A $50 fine accompanies a game misconduct. NHL publicist Ron Andrews said that no additional fine was levied. Douglas will miss the next two Toronto games, starting tonight in Montreal. The Leafs have recalled Al Arbour from Rochester to replace Douglas. The Toronto Marlboros took a 2-1 lead in their Ontario Hockey Association Junior A semi-final series with a 4-2 win over the Kitchener Rangers last night at Maple Leaf Gardens. The game was another uninspiring affair in what is becoming one of the dullest playoff series the OHA has seen in a long time. Marlboros grabbed a 3-1 lead in the first period and that pretty well removed all doubt about how this one would wind up. 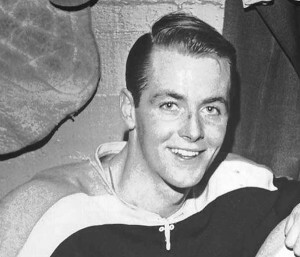 After Wayne Carleton had opened the scoring for Toronto, Bill Hway tied it up for Kitchener. Mike Corrigan then scored a pair of goals just under five minutes apart before the end of the period. Doug Dunville made it 4-1 for Toronto in the second period’s opening minute. Jack McCreary narrowed it to 4-2 with just over six minutes left in the middle frame. That was as close as the Rangers could get. 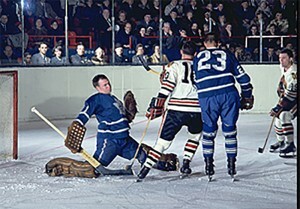 That was due mainly to the efforts of Al Smith in goal for Toronto. His work in the second period alone gave the Marlies the impetus they needed to take this one. He made several brilliant saves from point-blank range chances. We had the scoring chances. Marlies got the win. 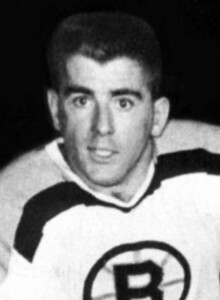 Danny O’Shea scored the only goal of the third period and it was enough to push the Oshawa Generals to a 3-2 win over the Montreal Junior Canadiens at the Forum in Montreal. O’Shea’s goal came at 3:19 of the final frame and was his second of the game. He had scored at 14:24 of the second period to tie the game at 2-2. Montreal took a 1-0 lead just past the 13 minute mark of the opening period on a goal by Chris Bordeleau. Bobby Orr evened the score in the final minute of the first. Bordeleau scored again early in the second before O’Shea’s first of the night tied it up again. Orr was once again dominant and played a big role in the winning goal. He made a rush into the Montreal zone and fed a pass right onto O’Shea’s stick at the Montreal goal crease. O’Shea flipped the puck into the net past Baby Habs goalie Ted Ouimet, who had no chance on the play. Oshawa now leads the OHA Jr A semi-final series two games to one. Myron Stankiewicz and Wayne Rivers each scored a pair of goals to lead the Hershey Bears to an 8-3 win over the Springfield Indians last night in Hershey. In the other American Hockey League game, Pittsburgh Hornets whipped the Cleveland Barons 6-2. Hershey now has won eight straight home games. Other goal-getters for the Bears were Gene Ubriaco, Pete Conacher, Roger Dejordy and Bruce Cline. Springfield, who at one time led the game 3-0 got goals from Randy Miller, Brian Smith and Jerry Foley. 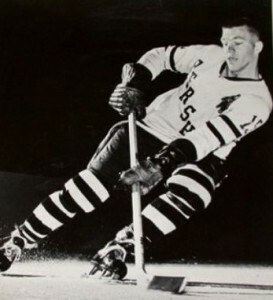 At Pittsburgh, rookie defenseman Jim Cardiff set up three goals to spark the Hornets’ offence. The Wasps’ goal scorers were Billy Harris, Bob McCord, Terry Gray, Andre Pronovost, Murray Hall and Ted Hampson. Larry Zeidel and Ron Atwell replied for the Barons. It turns out that the city of Buffalo stands in the way of a national television contract for the NBC television network to carry National Hockey League playoff games across the United States this spring. It was thought that the main obstacle to NBC telecasts would be the refusal of the two Canadian cities, Toronto and Montreal, to play afternoon games in the playoffs. Both clubs relented on their opposition to the plan and agreed to play whenever necessary to accommodate the American network. The problem with Buffalo stems from it’s proximity to Toronto. The NBC affiliate in Buffalo would normally carry the games. The problem arose when two major sponsors in Toronto refused to grant their permission. The sponsors are worried that viewers in Toronto, who can easily pick up the Buffalo station’s transmissions, would opt to watch the American program instead of games broadcast from Toronto stations, thus reducing viewership of their commercials. William Jennings, president of the New York Rangers is the head of the NHL’s committee tasked with negotiating a television contract. He said that the impasse is now in the hands of the league and he expected some sort of resolution within 24 hours. Wayne Rivers – recalled by Bruins. Toronto goalie Bruce Gamble reports his injured hamstring has responded well to treatment and he’s ready to resume netminding duties for the Leafs. Leafs Eddie Shack visited boxer George Chuvalo’s training camp. He turned down an offer of $100 to climb into the ring with the Canadian heavyweight. Boston Bruins have called up F Wayne Rivers from Hershey of the AHL. The New York Rangers have a “Mr. Clean” line. The trio of Phil Goyette, Don Marshall and Bob Nevin have only 22 minutes of penalties between them this season.